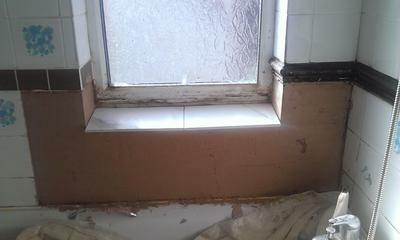 I have plastered round a window (the windowsill and surrounding wall) and was wondering how long before I can tile it. The tiles you can see on the windowsill are placed on top to check the fit and not bonded. You can tile over the plaster as soon as it is totally dry. When the plaster has been applied to the wall and starts to set it changes from a light colour to a darker shade. As the moisture comes out of the plaster - it changes to a lighter colour. When the plaster is a light colour it has dried out and is ready for tiling! Just ensure that the plaster is not too smooth - if it has been thoroughly trowelled really smooth then sometimes the adhesive will not properly bond to it. If it is then just rough it up with a bit of sand paper or scratch it to provide a key.